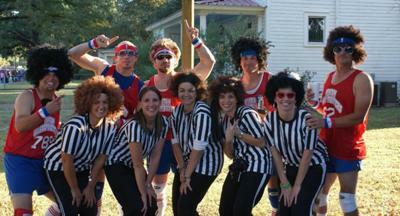 Our group decided to go as the Globetrotters & refs last year. 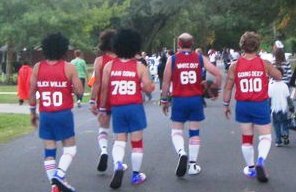 To make the complete funny Globetrotter costume we purchased the guys short shorts (to help complete the 70’s look), we made jerseys, found as many red white and blue accessories as we could find and completed the look with oversized clown style basketball shoes and really big hair. To make sure the look stayed with in the 70’s/80’s we found the longest basketball looking socks we could find, which was actually soccer socks and volleyball knee pads. Each of the guys added their own flair to their costume, you will notice in a few of the pictures the small touches such as the extreme chest hair, lol. We completed the jerseys with funny nicknames on the backs. The girls in the group completed our referee look with the black & white stripped shirts, whistles and huge hair. 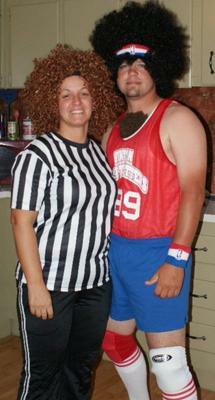 Needless to say this particular group of Globetrotters stole the show when we all took our children trick-r-treating! !